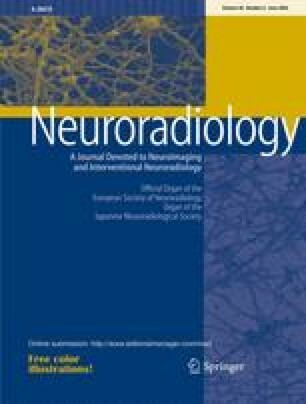 The aim of the study was to test the feasibility of the tractography technique based on diffusion-tensor imaging (DTI) for the assessment of small infarcts involving the brainstem. A patient who presented with an isolated left third cranial nerve palsy underwent magnetic resonance examination. Images were obtained by use of a whole-body, 1.5-T imager. Data were transferred to an off-line workstation for fiber tracking. The conventional diffusion-weighted imaging (DWI) performed using a 5 mm slice thickness could only depict an equivocal hyperintensity lesion located at the left paramedian midbrain. An additional thin-slice DTI was performed immediately after the initial DWI using a 3 mm slice thickness and was able to delineate the lesion more clearly. Image postprocessing of thin-slice DTI data revealed that the lesion location involved the course of the third cranial nerve tract, corresponding with the patient’s clinical symptoms. The tractography technique can be applied to assess fine neuronal structures of the brainstem, enabling direct clinicoradiological correlation of small infarcts involving this region.